As a special treat for MouseHunt's 11th Birthday, the King has opened up the doors of the super-secret SUPER|brie+ Factory to the public for the first time ever! The SUPER|brie+ Factory is an underwater facility that has surfaced just off the coastline near the Harbour. Once there, you will be able to visit the different rooms of the factory by accessing them from the Heads-Up Display. You can freely move around the factory and hunt in any room, each having different birthday mouse populations and special factory parts as loot from these mice. Be sure you pick a room as soon as you arrive so you can get to work immediately! If you have time to lean, you have time to clean! Welcome to the SUPER|brie+ Factory! Here, Magic Essence is pumped from the watery depths below and SUPER|brie+ cheese is manufactured by passing this essence along with raw, liquid cheese curds and whey through four very important steps. Each room of the factory plays a pivotal role in turning regular, old Brie Cheese into SUPER|brie+! Hunting in any of the rooms with standard bait will attract the usual birthday mice that will drop this year's birthday cheese: Coggy Colby Cheese. Using this mechanical version of Colby inside any room will attract specific birthday mice attracted to the mechanisms of the room itself. 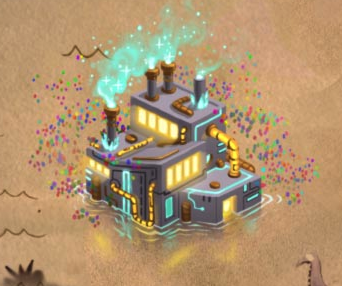 When caught, these mice will then drop a unique factory part that can be used to upgrade the rooms of the factory. Each successful capture with Coggy Colby Cheese armed will advance cheese through the production line. Once it gets to the end, you will encounter, Vincent, The Magnificent who has been keeping cheese crates from shipping. Capture this dastardly debonair and recover the produced package of cheese. With the damaged production lines, your initial packages of cheese will only yield small quantites of mostly plain Brie Cheese but as you upgrade the factory, it will begin to refine it and produce more SUPER|brie+ Cheese instead! Unfortunately, with the location now revealed, Vincent, The Magnificent has invaded it with an army of Birthday Mice and is holding all the shipments hostage while the mice have been running amok in the factory! The King needs you to clean up the factory, restore it to optimum production efficiency and make sure the packages don't slip into the wrong hands! The Cheesy Party Mouse, attracted only to SUPER|brie+. When caught, this mouse will drop larger quantities of Coggy Colby Cheese. The Factory Technician Mouse, attracted only with a Factory Repair Charm equipped. When caught, this mouse is guaranteed to drop more factory parts for your current factory room, plus a chance to drop bonus parts for other rooms. Upgrade this room to increase the quantity of cheese found inside of cheese crates. Upgrade this room to earn bonus loot from caught mice when they drop Coggy Colby Cheese. Upgrade this room to increase the litres of cheese that flow through the factory pipes after each successful catch with Coggy Colby Cheese. Upgrade this room to increase the percentage of SUPER|brie+ found inside of cheese crates. Earn Rewards For Your Hard Work! Every time you capture Vincent, The Magnificent, you will be rewarded with a Golden Punch Ticket. Check out the Trapsmith and Charm Shoppe at the factory to see the interesting rewards you can purchase with your hard-earned tickets! There are two Limited Editions Traps available for trade in the Trapsmith using Golden Punch Tickets, along with some other nifty charms and rewards. A birthday surprise party where the mice bring themselves right to the law enforcement! No need to serve fancy warrants or send elaborate SWAT (Special Weapons and Traps) teams! Just let the criminals walk right in! A seemingly lifeless pair of balloons lay dormant until an unsuspecting party person triggers this stellar celebration! Once a mouse gets too close, the music starts, confetti fills the air and the balloons begin to inflate with powerful Rift Mist to bring some out-of-this-world party people to life! A SUPER awesome theme to really industrialize your hunter's journal. A special birthday crate containing 20 Ultimate Luck Charms that provide a +20 luck bonus while armed! A special birthday crate containing 20 Ultimate Power Charms that provide +2,400 power and a 20% power bonus each hunt! A special birthday crate containing 20 Ultimate Lucky Power Charms provides the best of both. A staggering 2,400 Power and a 20% Power Bonus on top of 20 Luck!! Also, completing the adventure to help restore the factory comes with unique rewards! You'll be rewarded with a Birthday Banana Cake Base and 10 Hunter's Horn Rewind Charms. A blissful slab of exquisitely decorated banana cake. Baked up fresh for MouseHunt's eleventh birthday celebration! This magical time-shifting charm has a very unique effect on your Hunter's Horn. While equipped, if you or a friend sounds the horn to go on a hunt and your trap fails to capture a mouse, the clocks will be rewound! There are two types of Treasure Maps to embark upon to earn great rewards, including a special Anniversary Aura that gives any mouse in the entire Kingdom a chance of dropping a piece of SUPER|brie+ when caught! Opening any of the new Birthday or Gilded Birthday Themed Treasure Chests will reward or extend this aura. • Producing a package of SUPER|brie+ at the factory will provide 1 day of aura. • Birthday Treasure Chests provide 2 days of aura. • Gilded Birthday Treasure Chests provide 2 weeks of aura. Although opening additional chests will extend the aura, the magic of the Anniversary Aura may not be extended beyond March 7, 2020. Grab some of these great goodies to help you in your adventure to help fully restore the SUPER|brie+ Factory to its former fully-functioning glory! Coggy Colby Cheese is a favourite of factory workers everywhere! Use this cheese while hunting in a room of the factory to lure various event mice towards your trap. They will drop parts to help upgrade the factory and push the cheese along the factory production line. A special charm that only works in the SUPER|brie+ Factory. Equip this for a chance to encounter the Factory Technician Mouse who will drop bonus parts for the current room you are in and possibly some for other rooms as well! The Gilded Birthday Scroll Case contains a treasure map consisting of 20 mice spread throughout 2008 through 2013. The chest found at the end of this map rewards the Lucky Golden Shield for one month, 50,000 Gold and Points, 100 Ancient Charms, 25 Gilded Charms, as well as some Coggy Colby Cheese, and the chance of a birthday themed trap skin! As with any gilded map reward chest, the Gilded Birthday Treasure Chests have a chance of containing a Slayer Scroll Case. Using Rare Map Dust will lead to a rare version of the chest that has double points, gold, and ancient charms, a higher chance to contain a Slayer Scroll Case, and a guaranteed birthday themed trap skin! Click here to travel to the SUPER|brie+ Factory!